Need a car, van or truck for just one day? Sometimes, a one day rental is exactly what you need. Cram all your errands in one day and save. Car-sharing won’t do the trick because often and depending on the distance, car-sharing after a few hours becomes much more expensive than car rental (see detailed comparison). Depending on the car-sharing plan you have, doing 250 KMS in one day will cost you a lot more than you budgeted. Please read the fine print and do some calculation, you will find that often-times car rental is a better deal and cheaper. 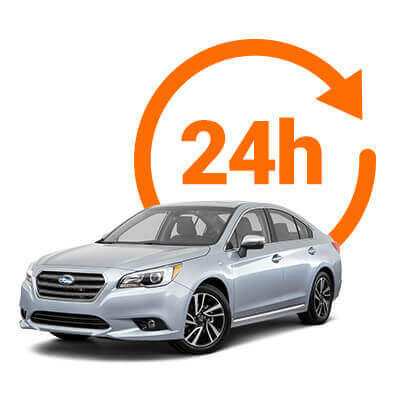 Same day rentals are based on supply and demand, but auto rates are cheap regardless, and we guarantee you the lowest prices for 24-hour car rentals in Montreal and Toronto. Globe’s entire fleet is available for 1 day rental, so chose from our large selection of vehicles including compacts, luxury cars, minivans, SUV, 4X4, vans and trucks. Note: Picking up the car and returning it the same day counts as 1 day rental. Great when you need a car rental quickly, Globe is ready when you are – especially at our kiosk locations that are open 7 days a week till 9PM! Book using your phone or tablet using our fast booking engine and save your money and time. Thinking of buying a used or new car? Why not rent it first before you commit to a long term lease or purchase! Get a feel for it in one, two days or a week. While we don’t guarantee specific models or colors, our fleet team will assist you if you have one model in mind, if you are flexible with the dates, then chances are we can help. Instead of taking your car, why not take our new and reliable car hire and make a statement in one of our luxury or SUV rental. Going far? Opt for unlimited mileage, and add mileage on our vehicle and not yours! Globe offers vans and moving trucks of all sizes to make your move easy and cheap. Check out our detailed comparison page on moving trucks side by side and determine what truck rental size you need and what is best for you. Cheap one-way rental deals on our entire fleet of car rentals are available. Whether it is driving from one city to another, or from one branch to the other, Globe has the right vehicle to make it comfortable, feasible and cheap. Don’t forget to add unlimited mileage or extra mileage packages for those very long trips!